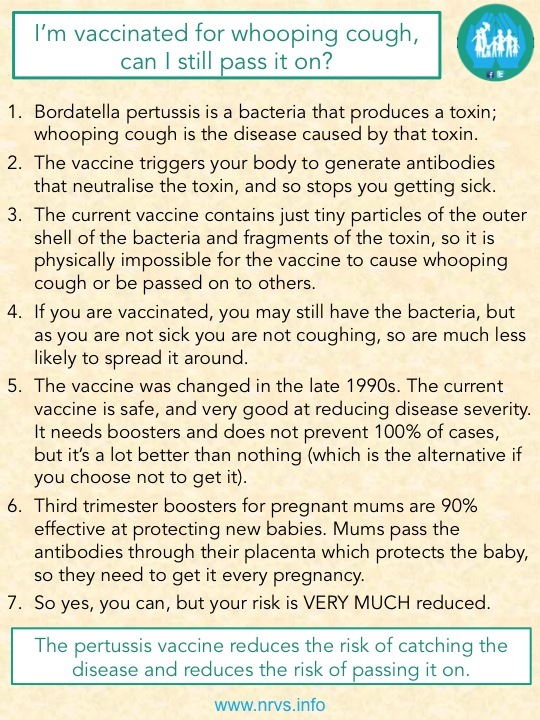 The pertussis vaccine simply cannot cause whooping cough, as it doesn’t have any live bacteria or toxin in it. It’s physically impossible. You can only get sick if you’re exposed to someone who’s infected, and if you and they are vaccinated, the risk is greatly reduced. However, no vaccine is 100% effective, and it is therefore always possible to get a disease even though you are vaccinated against it. There are a number of reasons why this can occur, and for more information about that please take a look here. If, despite the vaccine, you get the disease, you can then pass it on to others. 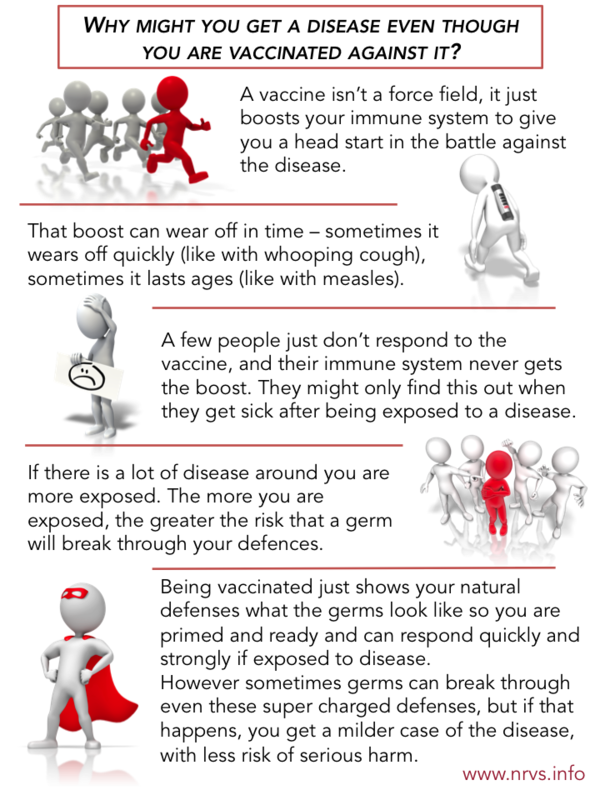 So as ever, common sense is important, and recognise that if you have a cough or cold, that may herald the start of more serious disease for yourself, and disease that could be life threatening to others – so if you think you might be coming down with something, whether or not you are vaccinated, don’t visit the very young, very old, or those vulnerable to serious infectious disease through illness or treatment. There is also some evidence that if vaccinated you can carry the bacteria in your body without being sick (this is called asymptomatic), and that therefore there is a theoretical risk you could pass it on (known as asymptomatic transmission). A study of whooping cough in baboons is often mentioned which compared the old and the new vaccine. This showed that in the test baboons who were vaccinated and then deliberated infected with the bacteria, the current vaccine did not necessarily stop them from carrying the bacteria. However, this study also showed that the vaccine leads to the production of antibodies that neutralised the toxin before any damage was done, so even if infected symptoms were not triggered (the baboons remained well). The study also showed that the old vaccine was much more effective at helping fight off the infection itself. The baboon study helped us understand how whooping cough makes you sick, and how the vaccine works to protect people from it. It confirmed that you can be vaccinated and have the pertussis bacteria in you and remain completely well, only a bit unwell, or have some symptoms that are not standard whooping cough symptoms. The study also suggested that baboons that were vaccinated might be able to spread the disease, but there is other evidence to show that this ‘asymptomatic transmission’ isn’t overly relevant in the real world. The current vaccine is able to reduce the incidence of disease in communities, and can protect the unvaccinated by contributing to herd immunity.